For a prolific composer who led such a long and interesting life, Tansman's music remains surprisingly neglected. Nevertheless, it is probably fair to say that the very best of that music is not to be found in his piano compositions, many of which were collections of miniatures - of which the Petite Suite featured here is a good example. 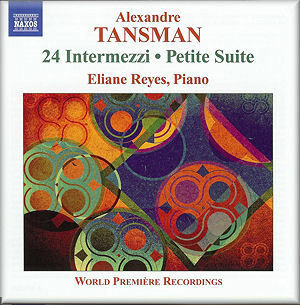 Whilst the Suite and the Valse-Impromptu are little more than bagatelles, the 24 Intermezzi constitute an important work, and deserve a place in the repertoire of any pianist, and in the heart and mind of every pianophile. Tansman composed the Intermezzi in four books of six, and they are best heard that way, at separate sittings, to allow the listener to appreciate fully the differences hidden behind the almost jokey title. And there are differences: in mood, tempo, virtuosity ... in so many ways, in fact, that the listener will find several contenders for favourites in each of the books. These works were written in troubled times after the outbreak of World War II, yet this is not dark, grim music, by any means; nor is it particularly Polish or French; like Chopin, Tansman was a Pole who spent most of his life in France. It is profound, however; distantly reminiscent of Chopin's 24 Preludes in many places (try No.8, for example), but in its 20th century context sounding more like a curious mixture of Skriabin, Fauré, Szymanowski, Prokofiev and, for good measure, Granados. The Petite Suite is a collection of seven very short pieces - five come in at well under a minute. The Valse-Impromptu is another very short work, appealing in a Gershwin-type way, but, like the Suite, with little about it that demands more than a single hearing. Though few of the works on this CD are particularly difficult, there is still ample scope for artistry, of which Eliane Reyes has plenty. There are no real comparisons to be made, however, because the Intermezzi and the Petite Suite are world première recordings. Neither the piano nor the recording are without their faults: the piano is very closely miked and a little too often mechanical noise is clearly audible, at least through headphones, and particularly in the Intermezzi. In No.2, No.7 and No.8 in particular it is quite maddening.